For the past 8 years, T has been the solo-preneur and designer behind Upper Metal Class. 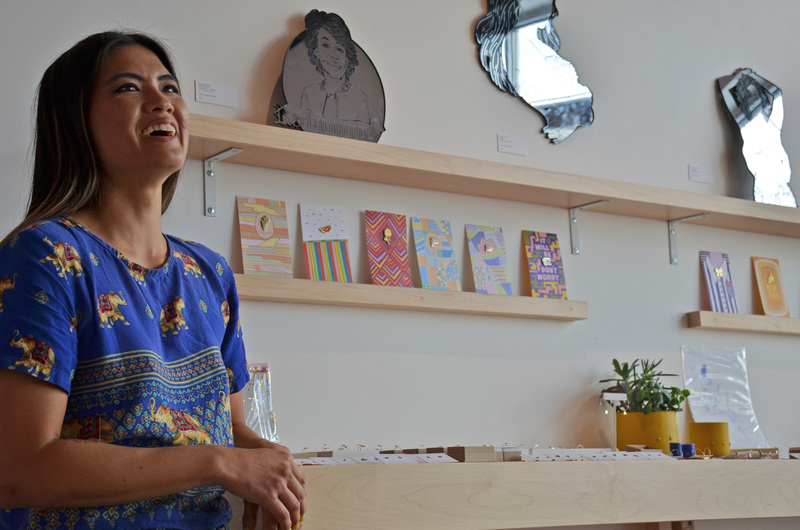 Last year, she launched Project Object, a boutique in NE, dedicated to representing the underrepresented that donates 10% of its profits to good causes*. 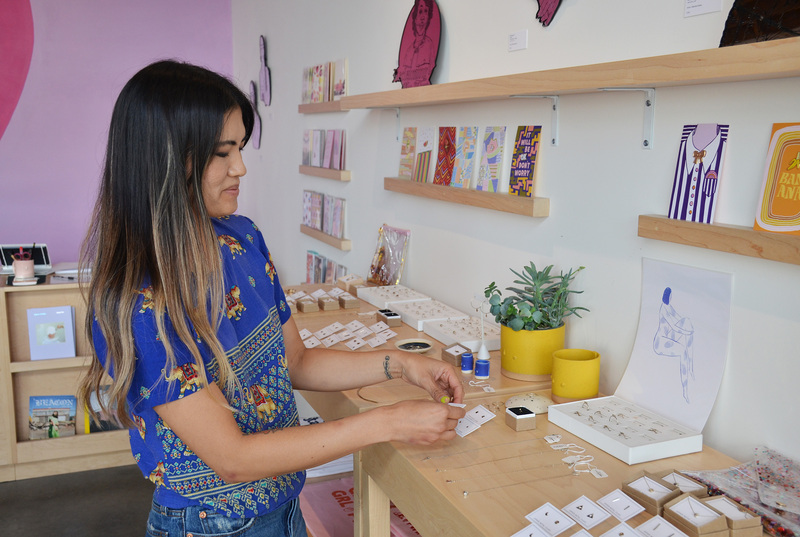 Her Portland studio and storefront is a place to make and sell her jewelry, as well as sell a curation of lifestyle goods from creative businesses owned by either women, LGBTQ, or people of color. *Project Object donates 5% to nonprofits and the other 5% goes towards funding their community events: fundraisers, art openings, pop-ups etc. 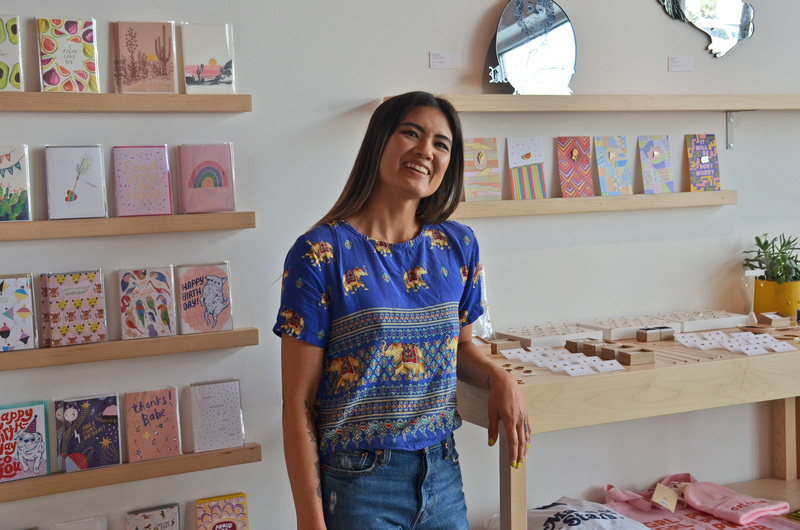 Upper Metal Class and Project Object have been featured in Portland Monthly Magazine, Mercatus, Willamette Week Finder Magazine, and last month she sponsored AOYP‘s September self-care themed monthly meet up. I started Upper Metal Class when I was in between careers. I went to school for Fashion Design and worked in the industry for about 6 years till I decided to quit because I was burned out from the long hours and toxic environment. In my case I was tired of the disrespect, racism, sexism and the treatment towards others from my past bosses. I eventually left and while I was figuring things out with what direction I wanted to go with my career I ended up taking some jewelry workshops just for fun. At the time there wasn’t very much minimalist jewelry out there that I really liked so I decided to make it myself. Eventually friends, family and random people I didn’t even know started to ask me where I got my jewelry from which lead to the start of me selling my work for fun as a hobby then becoming a full-time business. I really had no idea the impact I had created by making jewelry until I started to get customers telling me about their stories of how my work affected their lives. Stories of happy proposals, getting through difficult times, and amazing histories of families. I truly love this part of my job. To know that somehow my work is a part of someones life in a meaningful way. The most challenging aspect of my business is trying to separate business from personal. Although it is my passion and I love it the hard part is trying to have a balance in order to be able to maintain stress and live happily. I am a workaholic, but I know that it’s also very important to make sure I take a break so I can enjoy every aspect of my life. How do you go about developing or producing your products? Creating new products is definitely a process. It can be hard to get into the production routine of filling wholesale and retail orders so it’s a bit of a discipline to make time to design. That part for me can be a struggle. There’s a pressure of coming up with something that I will like and hoping that others will as well too. I try to make pieces that I want to see out there and make sure it is made with quality and care. It’s hard to pick which of my products is my favorite, but for now I think it would have to be my newest line called the Kindred Collection. I wanted to play with the idea of links and how they symbolize connection, togetherness and unity. I thought it would be fun to use an everyday chain design to put a new element to it through the use of different shapes and movement. It’s my new favorite! My collaboration process is pretty simple. I try to ask questions that give me as much detail as possible to get a better idea of what they have in mind. A lot of times they normally know exactly what they are looking for and I’m just there to be able to guide them through it in order to get that idea out onto paper. Then we work through the logistics on whether these ideas can be translated into metal form or if things may need to be change to create a better design. We go through sketches, prototypes and then an end product. Currently I’m super excited about my collaboration with Tender Loving Empire for their artists collaboration series. The pieces we made together connect with music and makers which embodies their business since they work with musicians to help produce music albums and they work with artists to showcase and sell their products. I would love to collaborate with more companies looking to make custom pieces for their own business. Whether it’s a small or large private label line or pieces that they want to make for seasonal gifts. It would be cool to work with national parks or museums to create custom pieces for their visitors too. 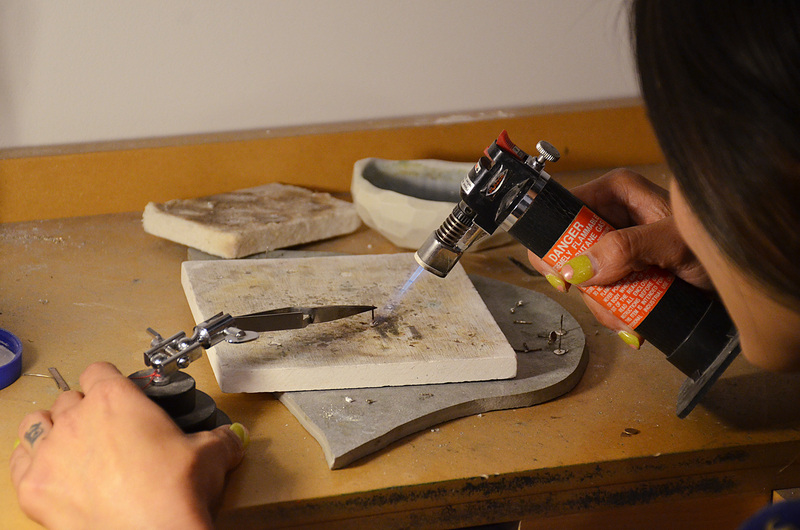 I’m happy to help anyone who has a jewelry idea looking to make them come to life. What do you wish people knew about being a minority business owner/women working in Portland? When it comes to getting services such as repairs, construction, contracts etc I’ve had to work harder at making sure I wasn’t getting ripped off. I’ve had to learn to stand my ground more to ensure I got what I needed instead of being disregard or blown off. In the past couple years, I’ve learned about really great organization and resources like Prosper Portland and Mercatus. I wish I had known about them before because I find them to be a really great support for minority business owners. I trust them and the community they work with and want everyone to know about them. What advice would you give a fellow female or minority looking to start a business? I think it’s important to find other business owners you can confide in. It is important to find people who you can trust and help each other through the process long term. Portland A&O powered by Prosper Portland aims to support the success of Oregon’s 800+ Athletic and Outdoor firms through community, peer-to-peer learning, events, and programming. Consumer goods, including handmade goods and accessories, represents a primary driver of entrepreneurship and economic growth within this cluster. Portland A&O Community monthly features are our way to highlight the local talent behind Oregon’s impressive A&O industry. By sharing stories, advice and experiences, we can continue to elevate the industry and the people who make it thrive.